WHAT A GAME!!! Well done Cardiff. Valiant effort from Swansea in difficult circumstances for their club. Huw Roberts, having just been denied in the corner, dives in under the posts. Beautiful play. Swansea finally dirty Cardiff’s sheet, as their 12 breaks numerous tackles to score. Cardiff will be disappointed in their defence, too many missed tackles so close to the end. Wall takes Cardiff to 10. That’s tries not points…. Stonehill batters himself to score Cardiff’s 9th. Gareth Ansell crushes his way to score a try. Charge down Charlie Dyde breaks the second half deadlock to take Cardiff to their half-century. We’re off for another half! Now for the half-time entertainment, I feel like I’m at the Super Bowl! Owen Davies throws an audacious but accurate pass for Ramage to dance across the line. George Thomas strolls in for an easy try following a beautiful move straight from the training ground. Rhodri Wall sprints down the wing and dots down following another sensational pass from Ramage. James Davies puts a gentle chip through for Owen Williams takes well and powers over. Marcus Ramage passes effortlessly to Owen Williams to run over a simple try as Davies again converts. Beautiful chip and chase on the counter attack from scrum-half Owen Davies. James Davies slots a simple conversion. Kick Off!!! Here we go! 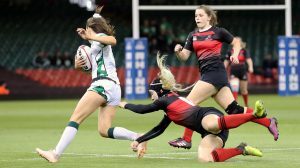 Now that the ladies rugby has concluded, the 2019 Welsh Varsity comes to a close with Cardiff coming away 29-17 overall winners. A fantastic effort by all the Cardiff teams who have put on a brilliant showing once again. Now it’s down to the men’s rugby to cap off the day with Varsity Cup success. Heartbreak for Cardiff as Swansea have stollen it right at the end. Cardiff have given everything but they have lost the game in the final few seconds. Amazing scenes at the Principality. Swansea looked destined to score and win the game but some heroic goal-line defending keeps the visitors out. Numerous phases of possession leads to an inevitable try for the away team. The following conversion is no good. The home side is back in-front and the conversion has been made! It’s a cycling double for Swansea who have also come away victorious. Swansea win the men’s cycling in a narrow 109-108 victory. Another point for Swansea who take the kickboxing. The visitors are refusing to give up and keep finding ways to stay in the game. Conversion missed. The home team are back in front. Cardiff have dominated the second-half and deservedly lead. Swansea pick up another yellow card. Can Cardiff take advantage? Great start to the half and Cardiff draw level! Conversion missed. Swansea and Cardiff cannot be separated and the points are shared. Swansea score a third try just before the end of the first half. A very close first 40, with both teams showing their attacking prowess with a total of five tries being scored already! Cardiff showing heroic resilience and securing a second try to equalise before half time. Conversion missed! Patient play and Swansea cap off a good move with another try. Conversion missed! Swansea have been reduced to 14. The visitors respond with a well-worked try in the corner. Conversion missed! The hosts take the lead but the resulting conversion is just wide! Swansea take the hockey in convincing fashion coming away 6-2 winners. The boxing has ended in a draw so both Cardiff and Swansea each earn half a point. Swansea retain the boxing Varsity shield. Swansea women have come out 3-2 winners in a tightly contested affair. Swansea now lead 6-2 with 12 minutes to go! After falling behind 2-0, Cardiff responded brilliantly and drew level after Ed Carr grabbed his second of the game via a penalty. But, Cardiff’s resurgence was short-lived. Swansea have really affirmed their grip on the game and have raced out to a 6-2 lead. Cardiff University are victorious at Radyr with the golf club winning their match. Also, the cricket team have successfully made it six-straight Varsity wins after bowling Swansea out for 148! Fantastic effort from everyone involved at CUCC. With both the men’s and women’s tennis teams gaining unassailable leads in their matches, Swansea are unable to overtake Cardiff! It’s been a scintillating first half at Sport Wales. Cardiff led at 1-0 before equalising when 1-2 behind. Victory for Swansea after a tight end to the fixture! By our calculations, Cardiff only need to win FIVE more of the remaining 19 events to regain the Varsity Shield! Cardiff make it 2-0 through Ashley Davies for her second of the game. 12 minutes remaining! Over at Newport CC, Cardiff finish with a respectable 167 for 6. Andy Gorvin rallying the troops with an impressive 56 from 30 balls. No, we haven’t typed it wrong, lowest score wins in equestrian and the girls are victorious! Meanwhile on Court 4 Cardiff’s Alice Warren and Panteleima Nicolaidou have lost in a tie break of 10-6 in their final set to Swansea’s Amy Basford and Lena Klein. GOAL! Cardiff take the lead in the 20th minute after a loose ball is poked home from close range. GOAL! It’s 2-2 at Sport Wales thanks to Munashe Mundaza! Full time at Llanrumney and it’s a win for the Titans. Cardiff will be happy to have not been on the end of a drubbing like last year so there are some positives to take! At the end of the third quarter, Cardiff lead Swansea 70-27! Elsewhere, another point on the board for Cardiff as men’s frisbee finishes 12-5 to the home side! PENALTIES! After a late equaliser from Cardiff, Swansea win the decisive penalty shoot-out 3-1. Cardiff are looking comfortable at the moment at Cardiff Arms Park. Men’s Doubles: On court 1, Cardiff’s Owain Atkinson and Tom Davenport win the match in straight sets 6-3, 6-2 against Swansea’s Matt Sharp and Matt Lloyd, who was able to play doubles despite ankle injury. Lloyd will not be playing singles, however. The Cobras looked to have got back into the game at Llanrumney but two quickfire tries from the Titans sees Swansea extend their lead to 28-13. Thanks to our friends at Xpress Radio, women’s fencing turned their league success into an incredible win in Varsity! The men’s football are into the lead early on! 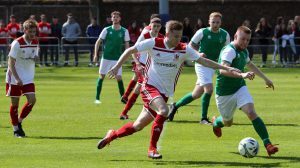 Martin opens the scoring for the home side. SCENES! With just minutes remaining, Cardiff knick one at the back post, levelling it up at 2-2! TOUCHDOWN COBRAS! Ross Ludlow goes in from 55 yards after a fantastically worked screen-play! LETS GO! It’s the end of the first quarter at Cardiff have a very good lead! Victories in the men’s and ladies’ triathlon gives Cardiff two more points on the board! Is this where the tides turn for the Cobras? A huge stop by the Cardiff prevents the Titans from scoring again. It’s been a fast start for Cardiff in the basketball. Our reporter at Sport Wales, Emily Hatter, is impressed with the noise and atmosphere being created by the Cardiff fans! It’s a blistering start from the Swans who take the lead with a converted try. Our reporter Jack Vavasour has been impressed with Swansea’s number 11 so far. It’s currently 4-2 to Cardiff at the ladies volleyball with one game already wrapped up as a Cardiff win. The men are following in the footsteps of the victorious women as they lead 4-1 over Swansea, come on Cardiff! Cardiff are victorious over Swansea in the ultimate frisbee, well done girls! Victory for the netball team as they comfortably beat their fierce rivals! All set for freshers rugby at Cardiff Arms Park! Success in the doubles as both teams win their sets. Aidan Gibbons extends Cardiff’s lead in the singles with a win. It’s another Swansea score down at Llanrumney. The Titans’ quarterback touches down in the end zone. The Cobras look to strike back after an early score from the Titans. However, Cardiff are unable to get the one yard gain needed and Swansea regain possession. Swansea have their first point of the day after an impressive 125-98 win over Cardiff. Not long to go until men’s tennis here at Cardiff Lawn Tennis Club. We have been informed that Matt Lloyd, Swansea’s singles and doubles player, could be forced to draw out of the game through injury. 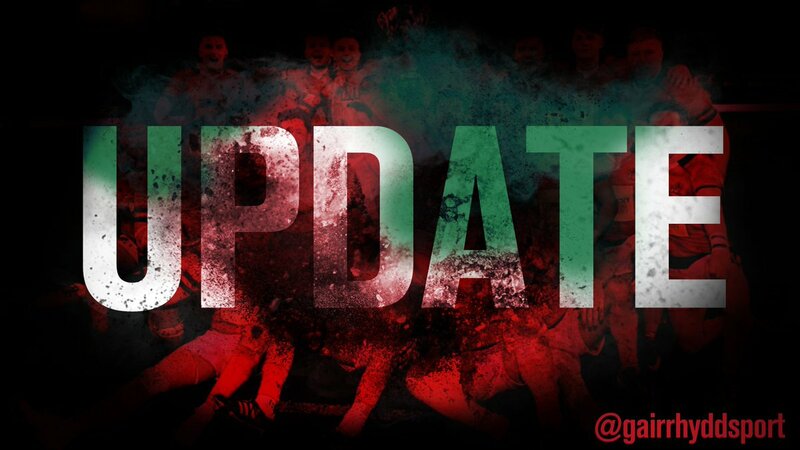 We’re underway at Llanrumney and Swansea have taken an early lead with a touchdown – the 2pt conversion is missed though. We have our first point on the board thanks to the ladies lacrosse team! Cardiff really pulling away now. Number 44 scores after a length of the field run! Cardiff’s goal attack looking good with composure in front of the net. Get down to Sport Wales if you have a chance! The heats are underway at the moment down at Cardiff Bay, finals on their way soon! Cardiff continue to lead over at the netball with a seven-point margin! Our reporter Ashley Boyle is over at Talybont Sports Centre watching the badminton. It’s an incredible atmosphere down at the women netball! Cardiff have the advantage at the end of the first quarter. Surely that’s the first point of the day for Cardiff? Cardiff are pulling ahead here in the second quarter. Come on Cardiff! Lacrosse is off to a flyer! Cardiff have taken the lead twice but Swansea have replied with scores on both occasions! Live updates to come from 9:30 AM at Sport Wales Astro Pitch, follow all the action here! Triathlon kicks off Varsity Day! Our reporter George Willoughby has just informed us that an important player in the Cobras team won’t be travelling with the squad. Not the best way to start the day! The Cobras are making their way to Llanrumney to face the Titans. Will they be able to make up for last year’s heavy defeat? It’s just gone 8.20AM and we’re set up for the day in the media office, follow all of our coverage throughout the day right here! Title race: determined by fate? Charles Leclerc: destined to be F1 World Champion? Gair Rhydd is a free weekly publication brought to you by the students of Cardiff University. Copyright © 2018. We are not responsible for the content of external websites. The information and views provided in these web pages are not those of Cardiff University Students’ Union.